The middle-class condition, seen during the twentieth century as both the symbol of progress and order and the means to achieve it, has largely evaded historical analysis. Blending historical methods and anthropological sensibilities, Intimate Ironies relates the everyday lives of an emergent white-collar middle class to Brazilian national politics in the twentieth century. Focusing on the period between 1920 and 1950, the author looks beyond ideologies to reveal how, amidst the turmoil of modernization, middle-class men and women strained to wrest order from the ordeal of change.Drawing on legacies of hierarchy and patronage and orienting themselves in very concrete ways to the middle-class ideal of Western modernity, these Brazilian men and women recast the meaning of work and home to set themselves apart from those below them and to project a sense of moral superiority over those above. 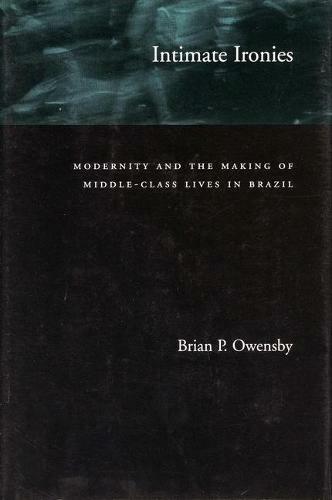 The author shows how anxieties growing out of this ambivalent position deeply conditioned their role in national politics, from experiments groping toward middle-class populism during the 1930's to the moralistic distrust of institutional politics that characterized the middle-class political outlook after World War II.Intimate Ironies represents a novel approach to the history of urban middle classes in the twentieth century. Most studies of the middle class have concentrated on culture or political behavior; rarely have the two been brought together. By linking everyday life and politics, the book reinvigorates the study of political history and class in modern Latin American societies, in the process complementing recent studies of organized labor and the industrial elites in Latin America. And by telling an unorthodox story of the middle class, the author challenges the very possibility of a linear, progressive narrative of social development.